Welcome to the finals of American Idol, where plus ça change, plus c’est la même chose—starring Jason Castro as Blake Lewis, David Archuleta as Melinda Doolittle, David Hernandez and Ramiele Malubay as Antonella Barba, and Amanda Overmyer as Sanjaya Malakar’s hair. Jason is the quirky, edgy one. David is the shy vocal genius pegged to win but doomed to be sent home early due to a fatal case of perfection—even the judges know this, congratulating David on every microscopic mistake that makes him seem “human.” David H. and Ramiele have the kind of racy past that did in Antonella last season, and as for the coiffure comparison—well, it’s not even just Amanda’s two-tone style. Really, when I look at the 2008 lineup, it’s been all about the hair. Since January, we’ve seen head after head of long, silky tresses, bizarre bouffants, and daring ‘dos. And those are just the boys. Danny Noriega and Ramiele Malubay had practically identical looks going during the semifinals, but there’s only room for one emo mullet in this competition, so Danny had to go. Robbie Carrico was voted out in the wake of rumors that his attempt at grungy rocker hair was even more faux than his attempted rocking. Next up are Jason Castro’s dreads, which apparently are in constant danger of falling off at inopportune moments in front of his girlfriends. 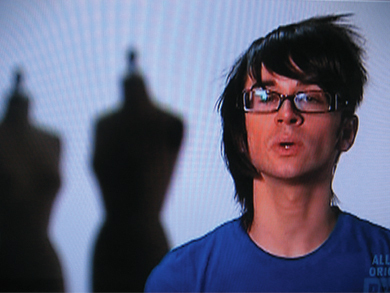 And Amanda, working the same concept as Project Runway winner Christian Siriano, seems to be sporting two self-contained hairdos simultaneously. For Siriano, it amounts to a sideways emo mullet—half Danny Noriega and half Anne Heche, or, as he described it, business on one side and party on the other—while what’s happening on Amanda’s head makes her look as if she is wearing Carly Smithson on top of a secret Blondie obsession. It might seem like I’m indulging a senseless fixation on cosmetic detail, but as Idol sponsor Sunsilk would say, “Their hair tells their story.” Danny’s ‘do spoke volume(s) about his willingness to take on the responsibility of shattering Idol taboos regarding certain expressions of gender identity and sexuality. Amanda’s hair, to me, is a symptom of an identity crisis, which shows in her song choices (Kansas! ), and I worry about her. And Robbie’s image issues served as a harsh reminder that to rock out on American Idol you have to prove that you are authentic, a word that the judges wield like a “Hammer To Fall” everysingletime anyone sings Queen or Lynyrd Skynyrd or Bon Jovi. Authenticity, I think, is also one reason why contestants are allowed to play instruments this year, to make them seem like real musicians. I’m not sure it works 100 percent, though. Sometimes it makes for an especially complete performance, like David Cook’s striking “Hello”; and it did allow Brooke White to sing the kind of Carly Simon piano ballad that is usually neglected on the show. But often the instruments just seem superfluous—a topic upon which Simon has expounded more than once recently, all the while offering contestants the new idiosyncratic hand gesture Ryan calls a “half moose.” Well, I suppose it’s better than the perennial middle finger, and it would have been gratifying to moose off that driver who cut me off on the 101 yesterday. Other highlights of the season so far: Paula fabulously Dancing Like There’s No Tomorrow (and singing like she swallowed a vocoder); Jason Castro’s lovely “Hallellujah,” sung in the manner, and sometimes in exact imitation, of Jeff Buckley; the return of prodigal Idol Blake Lewis and his sweater vests. And there’s been scandal, oh, yes: stripping and Christmas obscenities and girl-on-girl photos; former Star Search winners and abortive prior contracts. And yet the “most embarrassing stories” the contestants told during ‘80s week were sordid tales of forgotten lyrics and tragically unnoticed snot. As for the contestants with controversial previous experience, Simon Cowell charitably insists that they’re all only on American Idol because they failed with those contracts, so it’s not like the producers are stacking the decks with ringers or anything. Still, we’re told, this is the Best Talent EVER! I do think that the level of vocal skill this season has been a tad more even across the board than in the past, which makes it harder to choose and harder to lose each ousted contestant. We’ve said goodbye to some good voices, to the diacritically mysterious Alexandréa Lushington and Asia’h Epperson, to Jason Yeager’s boy-band past, and Robbie Carrico’s … boy-band past. Hey, maybe Jason and Robbie can form a new boy band together! OK, I just went to this site to randomly generate a band name for them and got a list that included “Idol Turkey and the Rational Two-Piece.” Forget Yeager and Carrico; I’m using that for my band. And so, with the selection of the Top 12, the show has really only just begun. The next two months will see the competition intensify and bring the inexorable return of the brilliantly self-promotional philanthropaganza “Idol Gives Back,” with a star-studded guest list including Brad Pitt, Mariah Carey, and Snoop Dogg. (Perhaps he will sing with Miley Cyrus!) And the biggest news of all: Almost a year ago, I was whining in this space about “British Invasion Night” without the British Invasion—well, this week we are finally going to hear the Idols take on the Beatles songbook. Here’s hoping that Chikezie tries out a mop top.